The Washington Capitals ran away with the Presidents' Trophy during the 2015-16 regular season, all but having the NHL's overall top seed wrapped up months before the end of the season as they raced to 120 points on the year - 11 more than the league's second place team, the Dallas Stars. Barry Trotz was the coach the Capitals hired to help turn around a team that had been on the decline under previous head coach Adam Oates, and Trotz was supposed to be able to install the defensive system that would give the Caps a solid basis to support their talented offensive players. Justin Williams was brought in to give Washington a championship pedigree to go along with that playoff clutch factor he's known for. Along with the T.J. Oshie trade, the 2015 offseason moves were supposed to help push the Caps over the top. Yet four games into their second round series against the Pittsburgh Penguins, the Washington Capitals are teetering on the brink of failure. After winning Game 1 4-3 in overtime, they'd lose Game 2 despite the best efforts of Braden Holtby, who stopped 33 of 35 Pittsburgh shots in the loss. They'd lose Game 3 as well despite directing 49 shots on goal and dominating the gameplay after falling behind 2-0 early. And they'd lose Game 4 after desperately attempting to manipulate the NHL into giving Pittsburgh's most irreplaceable player, Kris Letang, a penalty in the wake of his late hit on Marcus Johansson in Game 3. Now, they'll head back to Washington reeling, having to wonder how they've continued to come up short regardless of what they've had going their way. They'll have to wonder how through 4 games they've been incapable of solving a 21-year-old rookie in the Penguin net, who has stymied Washington to the point of visible frustration. They won't just have the weight of a 3-1 series deficit on their backs though as they attempt to comeback. It won't just be the pressure of winning more than a single series after running away with the Presidents' Trophy. And they won't just be looking to avoid having a great opportunity to win a championship slip away. No, the Capitals will have the brunt of a fan base repeatedly burned in the postseason bearing down on them as they attempt to keep the series going in Game 5. They'll have to worry about having won barely more playoff series (currently 4) than Presidents' Trophies (2) over the past 7 seasons. That they've won more division titles (6) than playoff rounds (5) during the Alexander Ovechkin era. That up to this point they've lost 7 out of 8 postseason match-ups against the Pittsburgh Penguins, often in embarrassing fashion, and threaten to do so yet again. The backlash against Washington if they fail to advance will be predictable, but it will also be accurate. Alexander Ovechkin will be labeled as a loser - he and the Capitals have fallen short in the Stanley Cup Playoffs, he and Team Russia have fallen short in the Olympic Games, and the only thing he's won since entering the league are IIHF World Championship Gold Medals - a consolation prize for those knocked out of playing for the true prize of any hockey player as the calendar turns to spring, the Stanley Cup. 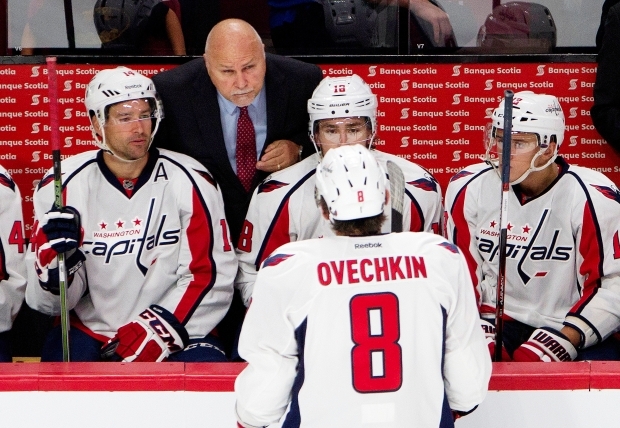 Barry Trotz too will be branded a loser, as he's managed to win just 4 playoff series in his 17 years as a head coach. Like these Capitals, he's never made it past the 2nd round of the playoffs. He's a defensive minded coach who can't make it happen when defense matters the most. The excuses and the blame game will run rampant, and it's already started during the series. Barry Trotz tried to deflect the blame for any impending series defeat aside when he insinuated that the NHL favored the Penguins. The Capitals blatantly and desperately lobbied for a Kris Letang suspension on a play that never would face a loss of a postseason game under any other circumstances, and they went so far as to have Marcus Johansson fake an injury after playing the final two periods after absorbing the hit from Letang. It was an embarrassing display for a franchise that is firmly embracing that adjective. It'd be easy to emphasize with the Capitals' plight as a Pens fan if they didn't make themselves so unlikable. Pittsburgh fans surely can relate to what going home early as the higher seed feels like, as it's something they would do yearly under Ray Shero and Dan Bylsma. The ramped up expectations, the inability to find excitement in anything but a deep playoff run zapped the regular season and early postseason rounds of their meaning, and it was a noticeable strain on the players in the locker room as time went along. Of course, the Penguin franchise had a recent Stanley Cup to hang their hats on, being able to at least say they've won a championship in their career even when following up with another proved to be elusive. The Capitals can't even take solace in that, as their history since the lockout is filled mostly with bad memories. Maybe that's why they hang so many banners from the rafters of the Verizon Center - to distract from all the ones they haven't won. And the weight of all those championships they haven't won will surely be weighing them down in Game 5 and throughout the rest of the series. They were supposed to win. They were supposed to be doing better than this. They were always supposed to be doing better than this. It's entirely possible that they'll be able to win 3 straight games to take the series as at times they've been the better team on the ice, bu they've also played a Penguin team that's been more or less mediocre so far in building a 3-1 lead. It'll be a difficult task to pull off in any event, and any mistake, any turnover, missed assignment, fluke goal, wasted opportunity could spell the end of their season and bring about an offseason that cements them as failures. Because winning one playoff series in two years having won the Presidents' Trophy leads to few other conclusions. They'll be gripping their sticks a little tight on Saturday night - will it be tight enough to keep everything from falling out of their grasp?